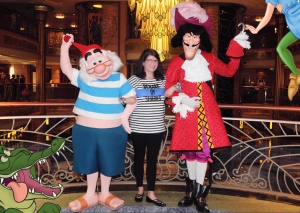 Should I Take My Young Child on a Disney Cruise? Cruises, and Disney cruises in particular, offer many wonderful activities for children and families. Parents of elementary-age children, tweens, and teens typically leave the ship raving about their children’s engagement in the onboard kids’ clubs, their independence on the ship, and their enjoyment of various port excursions. They had a fabulous time! Many families with smaller children, preschool age and younger, also have a grand time on board; however, a significant subset have a more neutral, or even negative experience while cruising. Typically, the negative reaction comes when there is a disconnect between expectations and reality. 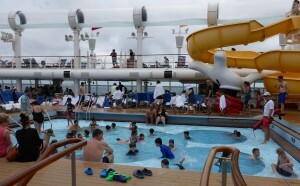 Some families with younger children find the ship pool areas overwhelming. When considering what to expect from a Disney Cruise, first remember that travel with small children is almost always more challenging than travel with older kids or grown-ups. Adults who are used to traveling as, well, adults may be surprised at the difficulties posed when traveling with young children. 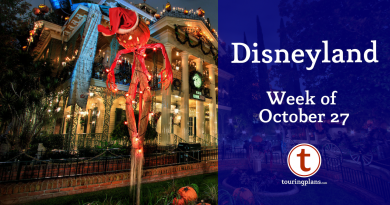 If the Disney Cruise is one of your first travel experiences as a young family, remember that many of the issues you will encounter are not specific to Disney or to cruising, it’s just par for the course with travel at that stage. My own daughters are now teens. They carry their suitcases and backpacks. They need no special equipment to eat or sleep. During downtime they’ll happily read or watch a movie with no intervention on my part. They have Red Cross swim certification levels higher than my own. In nearly every regard, they are equal or superior to me in their ability to travel with ease. When we go on vacation, I am on vacation. When the girls were much smaller, I carried their stuff, which included diapers, sippy cups, favorite blankets, and a panoply of amusements. I hovered over them during any water activity. I fussed over their food and sweated over their sleep. While I certainly have many happy memories of our early travel days, I rarely felt like I was truly relaxed. This “always on” feeling can be hard to reconcile with the cruise-as-ultimate-relaxation ethos that many expect. The kids’ clubs are exciting to some, but frightening to others. 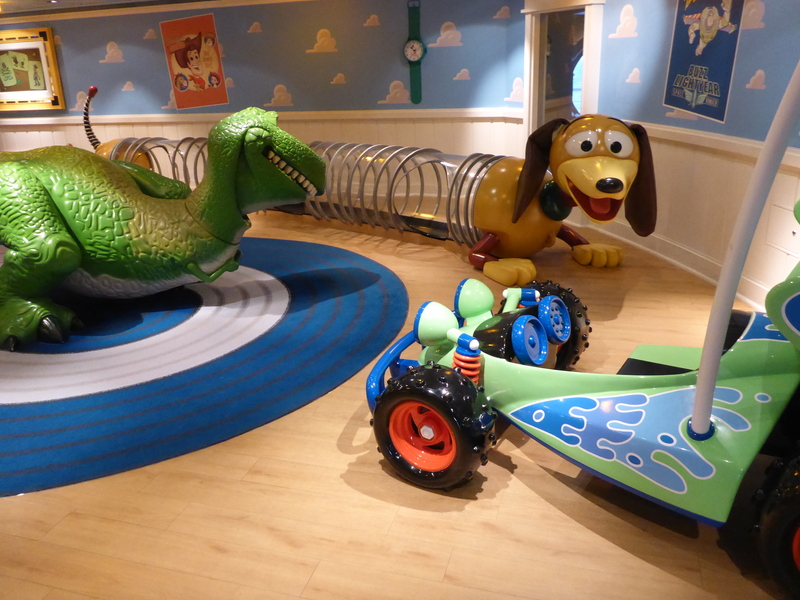 It’s certainly possible to have a fabulous Disney cruise with young kids in tow, but there are some things you may want to consider before you embark on a cruise vacation with a small fry so that you can adjust your expectations accordingly. In general, if you think “family time on the move” rather than “chill time for mom and dad,” then you’re well on your way to having a terrific experience. Is my child a good sleeper? Are there specific situations in which he or she doesn’t sleep? Any travel with small children may involve sleep disturbances, but there are perhaps more sleep issues to consider when cruising than when staying in a typical hotel room. The ship is moving. This seems obvious, but I feel its worth noting. Some children (and adults) find the motion of the ship to be soothing, like being rocked to sleep, while others find it disconcerting. A small child might not be able to articulate his distress or discomfort about this issue and, unfortunately, there’s not much you can do about the motion of the ocean if it does prove problematic for your child. If you know your child is particularly sensitive to vestibular stimulation (if he’s prone to car sickness, for example), you may want to discuss the issue with a medical professional prior to booking. The bedding may be unfamiliar. 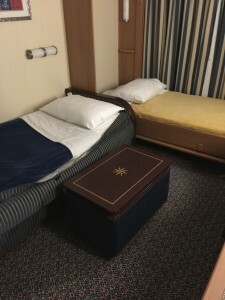 Disney Cruise Line does have Pack n’ Play cribs, the same ones that are in use at Walt Disney World resort, but full size cribs are generally not available. If your toddler won’t sleep in a Pack n’ Play, then you could use a bed rail on a standard stateroom bed (available upon request), or co-sleep with your child in the large bed. Any of these options may prove helpful or problematic for the child or the adults, depending on their sleep habits. Consider bringing your own Pack n’ Play sheets if you think that a familiar texture or scent may be soothing. Your child’s bedding may impact the rest of the family. If you are using the Pack n’ Play, be aware that even the small footprint of this device will have an outsize impact on the space available in your stateroom. You may be assembling and disassembling it several times a day. You may need/want to move your child when he is sleeping. Many of the most enticing adult activities take place after 9:00 pm, long past the bedtime of most preschoolers. The ship has ample provisions for childcare, with the Small World and Flounders Reef Nurseries and the Oceaneers Clubs available to watch your kids until the wee hours. However, in the event that your child falls asleep at the childcare facility, you will have to move him back to your stateroom. Some kids will find this unsettling. Your stateroom attendant will need access to your room. A cruise stateroom attendant will need access your room much more often than a housekeeper would in a standard hotel room. Cleaning is frequent and only the attendant can do things like reconfigure a sofa into a sleep surface. If your child naps or goes to sleep early, communication with your stateroom attendant is imperative. Let him or her know what time you want your room made up for the day or set up for the evening. And be sure to make use of the “do not disturb” sign during nap time. Stateroom constraints may limit adult activities while the child is sleeping. No, I’m not talking about “adult activities,” but that too. What I mean is that most staterooms are set up such that the verandah and television are both placed on what would naturally be the child’s side of the room, away from the main queen-sized bed. If you’re in your cabin early because your child is asleep, two of the most obviously enjoyable things for an adult to do would be to sit on the verandah and read or have a drink, or to watch one of the many on-demand movies on the room TV. If your child is a light sleeper, both of these activities may be effectively off limits. 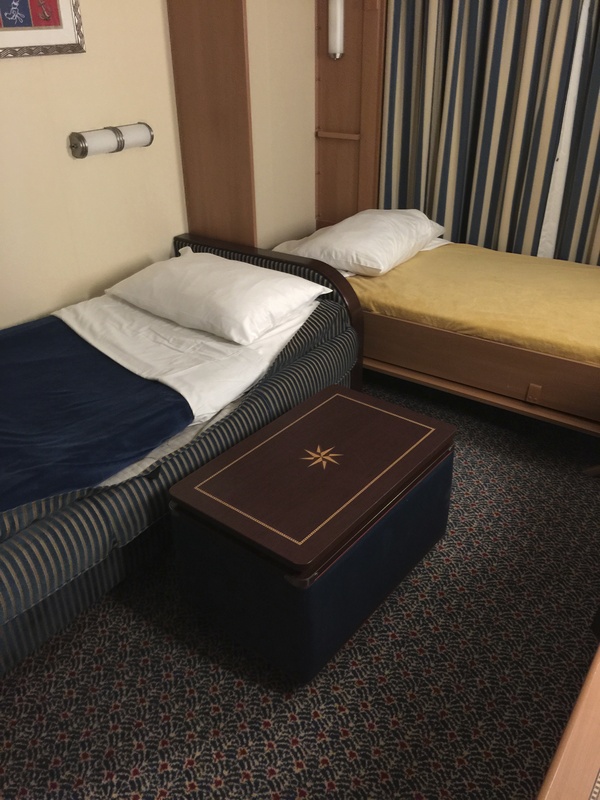 Consider whether getting two connecting staterooms might make for a better overall experience. Consider whether or not your toddler would be comfortable in a standard bed. How does my child react to changes in his or her schedule? Many younger children react poorly to changes in their nap or eating schedule, particularly if the schedule is disrupted for several days in a row. 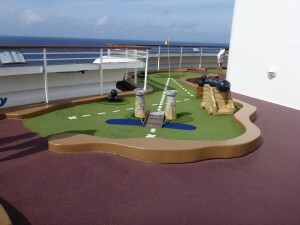 The activities on the ship are at set times, which may not be times that suit your child’s schedule. Is your child one who can rebound easily, or are meltdowns inevitable? One particular area for concern is the assigned dining time. The Disney Cruise Line main dining rooms have two seating times, typically 5:45pm and 8:15pm. Most US-based families with younger children find the later dining time to be incompatible with the child’s sleep schedule. You can select the earlier time, but depending on when you booked your trip, it may not be available. Of course you’ll never go hungry on the ship, but consider what your plan will be in the event that you’re given the later seating. Will you have your child stay up late? If so, how will this impact his temper and other aspects of your trip? Will you skip eating in the main dining rooms? How will this impact your perception of your vacation? Will you let your child fall asleep in a childcare center while you eat during the later seating? Will this be a plus or minus for your own enjoyment of the trip? Do I have any claustrophobia issues? Does my child? Due to the nature of the ship, space is more compact that you’ll find in most land-based locations. Staterooms are smaller than many typical hotel rooms. The stateroom bathrooms may be smaller than you’re used to. (A large man trying to bathe an infant in a half-size stateroom bath is a special kind of amusing.) The hallways are narrow and the ceilings are lower than you may be used to. Of course there are plenty of more open spaces on the ships; the atria soar, the dining rooms are spacious, and the upper decks are open to the sky. However, if being in smaller than normal spaces makes anyone in your party anxious, it may be more challenging to cope with other aspects of the trip. Costumed characters may be frightening. Do I have any issues with crowds? Does my child? There is a fixed maximum number of people on the ship, so you won’t experience the unlimited crowds onboard that you might at one of Disney’s theme parks. However, there are some times when there are crowds and lines. Some of these situations are avoidable, such as at the dance parties, but others, like the mandatory safety muster, are not. Most of the crowd situations can be avoided if you’re traveling with adults only (relax on your verandah, dine at Palo, visit the adults-only beach at Castaway Cay), but many of the experiences that appeal to small children (pool time, character greetings) happen to be in more crowded situations. If waiting in queues will be particularly troubling for your young child, or will impact you in a way that saps your patience with your child, then this may not be the ideal time to cruise. Does my child have issues with costumed characters? By age five or six, most children outgrow any reticence about seeing or interacting with costumed characters. But a moderate percentage of toddlers and preschoolers find the characters to be terrifying, (I mean, a GIANT mouse. I get it.) with said terror resulting in a meltdown for the child and then subsequently a meltdown from the parent. I find it relatively easy to avoid costumed characters in the Disney theme parks. 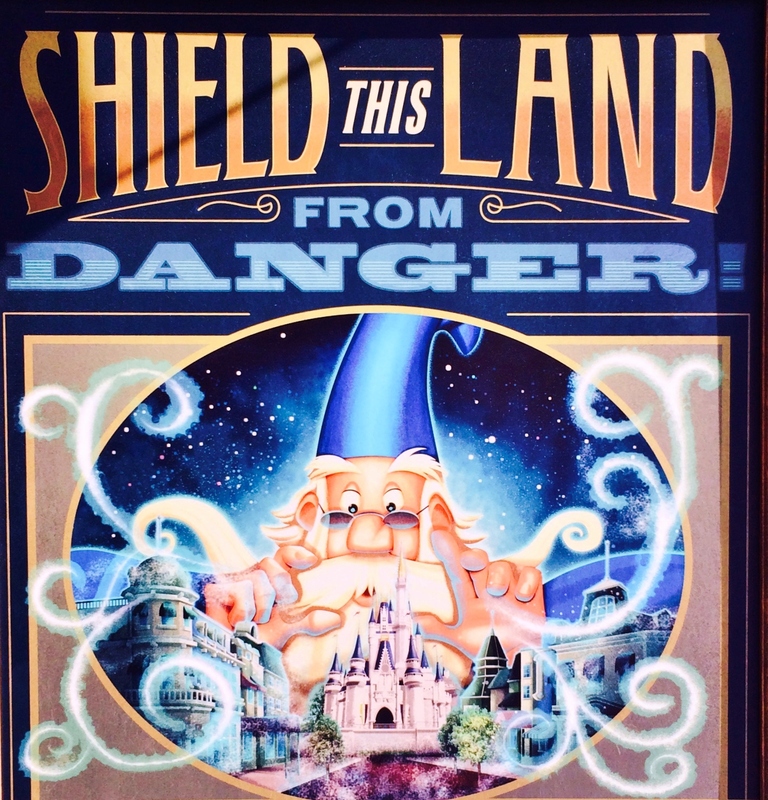 In the parks, you can find walking paths a fair distance away from the characters. This is not as true on the Disney Cruise Line ships. Many of the character greeting opportunities take place in public areas such as the lobby atria or the at the exits to the main theaters. Given the narrow hallways and central locations of the characters, you will very likely be quite close to them on several occasions. If your young child has a serious character aversion, you may want to wait a bit before booking. One thing to consider if you do decide to cruise while your child is in character aversion mode — the characters sometimes make planned, or even surprise, visits to the onboard child care centers. If you know that this will upset your child, be sure to let the staff at the child care center know. They can either arrange to keep your child in a different room during the character visit, or alert you in advance to remove your child. Treat time foods are easily accessible. Does my child have any food idiosyncrasies? 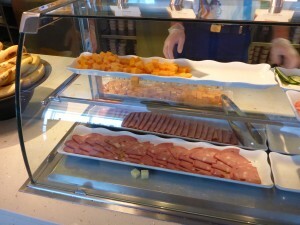 The Disney ships offer a wide variety of food, offered virtually around the clock. But the limited capacity of a ship’s kitchens means that not every possible food will be available in every possible form. For example, the ship will have macaroni & cheese, but it may not be the same mac & cheese that your child is used to. (Orange?!?! I want white!!) Of course food fussiness can happen at any age, but inflexibility and true breakdowns are much more common with younger kids. An additional confounding factor is that bringing/preparing your own food is effectively impossible on board a ship. If you were staying at a Walt Disney World hotel, you would have access to a real refrigerator in your room; unless you have a medical need (insulin storage, for example), your ship stateroom will have only a beverage chiller. At Walt Disney World, all guests have access to microwave ovens and toasters in the hotel food courts and there is the possibility of access to a stove/oven in some rooms; there are NO guest accessible cooking facilities on board a ship. The ship may be able to lend you a bottle warmer, that’s about it. Additionally, most ports have regulations concerning the carriage food on and off a vessel. On the plus side, if a food item exists on the ship, chances are your child can have it when/where he wants it, as long as you have a bit of patience. For example, you can order from the dinner menus of any of the main dining rooms, no matter where you are in your dining room rotation, but be aware that this may take a few minutes longer than ordering from your own dining room’s standard menu. The kitchen staff is also able to puree almost anything served in the dining rooms, to change the texture for a young eater. Nevertheless, if not having access to very specific foods is an issue for your fussy toddler, you may want to wait a bit until he outgrows this phase. Do I have particularly strict rules about food consumption? In my personal experience, first-time parents of small children tend to be fairly strict/nervous about the quality and quantity of their child’s food consumption. If you fall into that category, be aware that the opportunities for exposure to perhaps forbidden items is nearly endless on a cruise ship. Soft serve ice cream is available in limitless supply next to the pool. Donuts are on display at the breakfast buffet. Dessert is available at lunch and dinner. Your child will absolutely see other guests eating these items. They are ever-present and enticing. If dealing with this will cause you stress, you may want to hold off on booking your cruise. The smallest children may not have the patience for family activities like mini-golf. Does my child have issues separating from me? For many families, the best part of a Disney Cruise in the on board kids’ clubs, which are free of charge for kids ages 3-17. The clubs are manned by energetic, friendly staff and offer a wide range of activities throughout the day. It seems cliche to stay that most kids beg to stay longer in the clubs, but it’s true. However, “most kids” may not include kids in the 3-5 age range who may have had less experience in large group situations or who may be in a separation anxiety phase. On my own first cruise, when my twins were three years old, I had visions of them playing happily in the Oceaneers Club while I sat on the verandah nursing a rum and Coke and working on my tan. This happened exactly never. My daughter Josie took one look at the unfamiliar Oceaneers space, put my leg in a death grip, and screamed in abject terror at the thought of being left there. In retrospect, I should have expected this. She had severe separation issues at preschool and it often took her weeks to warm up to new babysitters at home. Honestly, I was pretty disappointed with this first cruise, much of which centered around our inability to make use of the kids’ clubs. The clubs do have open house hours. During these times, you are allowed to experience the clubs with your children (during normal operating hours, it’s kids only). There is typically a long open house period during embarkation day. This will give you the opportunity to see the space with your child and get him acclimated so he’s not going in cold the first time. Most families will find this productive. You will, however, occasionally encounter a situation where a child visits the club with a parent and loves it, but doesn’t understand that later visits are intended to be parent free, which results in an unexpected tantrum. One mitigating factor is that on the Magic, Dream, and Fantasy, the kids’ clubs now offer a broader ability for kids ages 3-12 to interact with each other. A reticent four-year-old may be able to find comfort from a nine-year-old sibling or cousin if they’re at the club at the same time. Also consider whether you’re OK with letting your child “cry it out” in a public situation. Several families I’ve spoken to mentioned that they left a child at a DCL kids’ club while he was crying or asking not to be left there. They all noted that the kids were fine when they picked them up later. You may or may not be OK with this tactic. Is my child easily overwhelmed in most new situations? On a ship, the kids’ clubs aren’t the only thing that may be new or frightening to a child. There are new foods, new people, new activities, and loud ship horns, the list goes on and on. I’ve heard several stories about children being upset seeing the yellow lifeboats. It may be difficult to predict what exactly will unsettle a three year old, but chances are that you know if your child is the type to become easily unhinged. Additionally, you may want to consider that on sea days, there may be few options for separating your child from other people other than sitting in your stateroom. The ship will have cheese and coldcuts, but they might not be the RIGHT cheese and coldcuts. What will we do if my child doesn’t like the kids clubs? If an eight-year-old child doesn’t like the kids’ clubs, there are plenty of other age appropriate activities that he can do on board: Disney trivia, family dance parties, feature films, animation classes, craft projects, karaoke, the AquaDuck or AquaDunk, mini golf, shuffle board, etc. There are far fewer options for a three or four year old who doesn’t like the kids’ clubs. Their attention span may not yet be ready for a full-length film, trivia is beyond them, they don’t have the manual dexterity for drawing, they may be frustrated by an inability to sink a putt, and so on. Some of the primary options for non-club activity for younger children are the pool, which some families find too crowded or overstimulating, or watching cartoons in the stateroom, which you could do at home at obviously much less expense. If you think there’s a possibility that your child won’t be using the kids’ clubs, consider bringing a some diversions with you such as age-appropriate puzzles, books, or small building toys. Will child care impact my vacation budget? 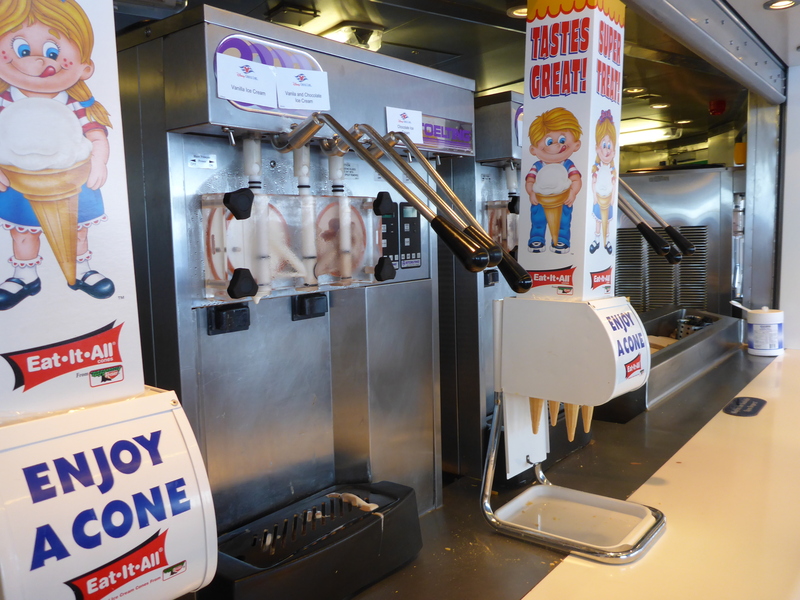 The kids’ clubs are included in your cruise price for potty-trained kids age three and up. The nurseries for babies up to age three do charge a fee for their services, currently $9.00 per hour for the first child and $8.00 per hour for each subsequent child in the same family. It may be relatively easy to leave your 10 month old in the nursery while you enjoy the sunshine, but be aware that those fees can sneak up on you. Will I be able to get child care when I want it? Children ages 3-17 are allowed unlimited use of the kids’ clubs whenever you/they want, with no reservations necessary. The nurseries (babies to age 3) work on a different system. They will only accept a limited number of children per hour, and reservations are required. Depending on how crowded your cruise is and what level of Castaway Club status you’ve attained, you may not be able to arrange sitting for your young child when you want it. Consider whether this will have a significant impact on your vacation. Is my child in an particularly active phase? Given the constraints of the ship, space is limited for many large motor activities. Additionally, there are many expectations for restrained behavior while on board (sitting still in a restaurant or waiting on line for a character greeting, for example). The kids’ clubs offer some physical activities, but they may not be exactly the type of activity your child is used to. Further, opportunities for ball play, climbing, and running are fairly limited for young children. If you have a child with separation issues who also needs lots of physical activity, or a child with separation issues with an aversion to water play, then you may want to think hard about whether this is the right time to book a cruise. Will I feel like I’ve wasted my money if I don’t get to experience everything the ship has to offer? Many of the most iconic cruise experiences take place in the post dinner hours. Given a young child’s sleep schedule, you may find that most adult, and even many family, offerings on the ship are inaccessible to you. If you’re eating at 5:45pm and you’re in for the night when your child is asleep at 8:00, then you’re going to miss the stage shows, family game shows, family karaoke, and many similar experiences that take place later in the evening. There are some partial workarounds; for example, the main stage shows are available on closed circuit TV in your stateroom. However, as I mentioned earlier, that TV is on the side of the room where your child may very well be trying to fall asleep. If you had been expecting to see the shows in the theater, you may feel frustrated. Does my child require a great deal of gear for personal maintenance or stimulation? Yet again, I mention that staterooms are small. Boxes of diapers, strollers, playmats, and similar items may feel particularly large in a confined space. Consider whether it might be more comfortable to experience the cruise when these items are no longer necessary. Who are we traveling with? What are their needs? Travel with a small child may go better, or worse, depending on your traveling party. Many folks with young children cruise with extended family. This can be a boon for Mom and Dad (or Mom and Mom or Dad and Dad) if Grandma offers to babysit while the parents enjoy Palo or the margarita mixing class. It can be a struggle for the parents if Grandma expects the entire clan to sit still for a three hour dinner every evening or if Grandma needs physical assistance or medical attention of her own. What ports will the ship be visiting? Are there appropriate excursions or other activities in port? Some families cruise to spend time enjoying the ship, while others find the port itinerary to be the key enticement. In either case, if you’re planning to leave the ship while it’s in port, review your port excursion options carefully. At some stops, there may be limited offerings for child under age five, or even for children under age eight. At other ports, excursions may be technically available to younger children, but are not practically appealing. For example, a five hour bike tour is probably not right for a four year old. With younger kids, you may want to consider arranging your own excursions or just going for a walk near the dock area. The counterpoint to this is that some families find cruising to be one of the easiest ways for a young child to experience a distant land. For example, a cruise around Europe with a four year old might be easier than other travel options in that area. With a cruise, you can see many destinations, but only have to pack and unpack once, for example. By the time a child is six or seven, it’s likely that he has been to school and developed strong coping skills related to separating from family, meeting new people, waiting his turn, and sitting still for extended periods of time. Additionally, a school-age child likely has a broader palate, little need for special equipment, and enough language skills to effectively communicate in productive ways. Each of these capabilities will serve to make cruising, or any travel, more relaxing for the entire family. However, there are certainly many families with smaller children who have positive experiences on Disney Cruise Line. Planning, patience, and realistic expectations can go a long way to helping you have a great trip. Many thanks to Moms Panelists Ana, Anna, Jacqui C., Kay, Lauren, and Teronya for their input on this post. Are you thinking about cruising with a young child? What are your concerns? Have you cruised with a young child? Do you have any tips for future travelers? What worked, what didn’t, and what happened that your didn’t expect? Let us know in the comments below. What a perfectly timed article Erin! I am in the process of deciding to take our by then 2.5 year old son on a Disney cruise later this year, or taking him on his first trip to Disney World, so this is really helpful. My main concern about a cruise, as I have never done one before, is that he does just like to ‘wander around’ a lot and explore rather than do set activities, which would be easy in Disney World (around the hotels, and in certain areas of the parks), but I worry there might not be the space/too many people to do this on a cruise ship? Thank you so much for this post. I’ve been playing with the idea of taking our almost-three year old on a cruise, but I think we’ll definitely do an adults-only cruise first (since it’ll be our first one) so we can completely enjoy ourselves, and get a good feel for the ship for a future trip. I’ve been on three cruises with my kids. They were 8,6 and 6 on our first cruise, so not extremely young, but young enough to worry about. After the first day everyone will be fine. 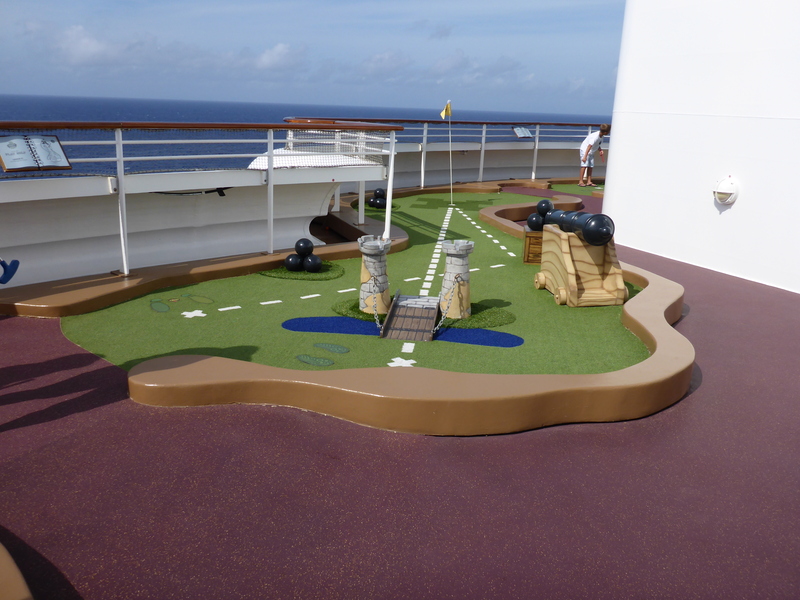 It will seem like an adult only cruise, since your kids will never want to leave the play areas. this article is very helpful for people like me who are planning to take their children on a vacation. Right you are! I’ve once heard that when you have kids, you take “family holidays”, not “vacations”. Totally different mindset, which I didn’t understand until our first cruise with the little one. I admit that I sometimes long for the days when we were “dinks” (dual income, no kids) and we could relax in the lounge with a good book but I take solace in the fact that DD2 won’t be totally dependent forever and really, I’ll have to shlep all that toddler gear pretty much anywhere we go on vacation… and let’s face it, Mommy isn’t going vacation-less for 5 years. C’est la vie! The thing I found most frustrating traveling with a one-year-old, was that he wasn’t allowed in any of the pools as he wasn’t potty trained. He could only go on the splash pad and that got really old, really fast for both of us. thank you for such a detailed and very well written article.